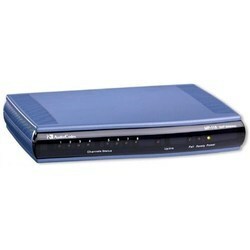 VoIP gateways convert analog and digital signals for transmission on an IP network. Likewise, a VoIP gateway can translate IP telephony into analog or digital transmissions. The gateways provide upwards of dozens of ports, with connection types such as FXO, FXS, T1, BRI and GSM. Deploy a VoIP gateway to facilitate telephony between an IP PBX and analog phones, for example. Or utilize existing PSTN lines as failover solutions, should your primary VoIP phone system encounter downtime. VoIP gateways typically provide greater management and more features than smaller form ATAs or VoIP adapters. 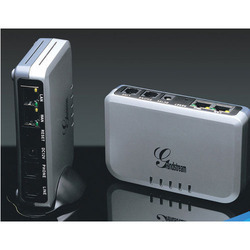 We are engaged in offering our clients a high quality range of Grandstream HT502 ATA - Analog Telephone Adapter. 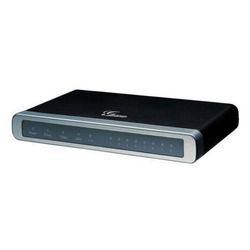 The product's inclusion of an integrated high performance NAT router and dual 10/100Mbps Ethernet WAN and LAN ports enables a shared broadband connection between multiple Ethernet devices. The offered range is manufactured as per the set industry norms using quality approved raw materials and sophisticated technology at vendors' end. Keeping in mind the diverse requirements of our clients, we provide the entire range in various configuration and technical specifications. In order to ensure the quality of this adapter, our skilled professionals perform a series of test against various parameters. Our organization has successfully expanded its business in market owing to the offered elevated quality array of Grandstream HT503 ATA - Analog Telephone Adapter. This functionality coupled with its compact size makes it an ideal solution for road warriors seeking the savings and benefits of voice-over-IP communication. Offered adapter is designed by our vendors' professionals in compliance with international quality standards. Our provided range is manufactured using the latest technology, innovative machines and the finest components. Moreover, it is tested on various stringent parameters to ensure its durability and quality. Keeping track with the market development, we are engaged in offering our clients with a wide collection of Grandstream HT701 ATA - Analog Telephone Adapter. It is an ideal single-port ATA for large scale commercial IP voice service deployment. The offered range is manufactured using high grade components and contemporary technology at vendors' end. We assure our clients that our range is quality tested on predefined parameters, in order to meet industry standards. Apart from this our prestigious clients can avail the entire range, as per their needs, at highly competitive price. To meet the diversified requirements of our prestigious clients, we are engaged in offering Grandstream HT702 ATA - Analog Telephone Adapter. The offered adapter is available in a wide variety of specifications as per the exact requirements of clients. The provided range is manufactured as per industry standards using the best quality components and sophisticated technology under the guidance of our vendors' expert team. In addition to this, clients can avail this adapter from us in customized options and at market leading prices. Grandstream HT702 and HT704 are ideal 2/4-port ATAs for large scale commercial IP voice service deployment.Their compact size, superb voice quality, rich functionalities, strong security protection, excellent manageability and auto provisioning, as well as unrivaled affordability enable service providers to offer high quality IP voice service at extremely competitive price. 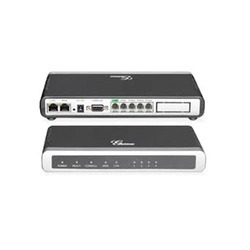 Grandstream Networks GXW4008 is FXS Series trunk gateway which is an ideal solution for businesses looking to connect one or more lines of a traditional PBX to a VOIP phone system or provider. 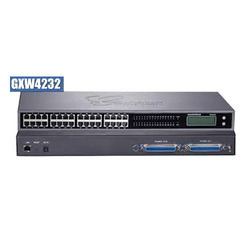 The GXW4008 features 4 or 8-port FXS interfaces for analog telephones, dual 10M/100M network ports with integrated router, PSTN life line in case of power failure, and an RS232 serial port for administration. Support for 2 SIP account profiles, caller ID for various countries/regions. Support for T.38 fax, flexible dialing plans, security protection (SIPS/TLS), and comprehensive voice codecs. Grandstrem GXW 4104 FXO IP Analog Gateway series offers the small enterprise, SOHO, remote offices and multi-location enterprises a cost-effective, easy to deploy VoIP FXO solution. The GXW410x series allows any business to seamlessly connect multiple locations with up to 8 PSTN lines, to an IP PBX system, or with an existing traditional phone system. 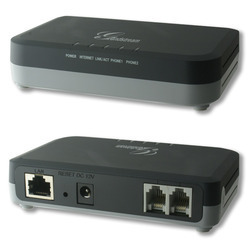 The GXW series includes two models with 4-(GXW4104)or 8-(GXW4108) ports respectively. GXW4104 Designed and tested for full interoperability with leading IP-PBXs, soft-switches and SIP-based environments. Grandstream Products Based on open industry standards. 4 FXO port media gateways. 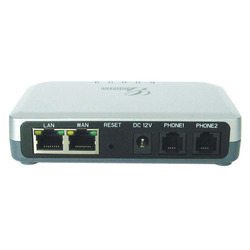 Grandstream GXW410X FXO IP Analog Gateway series offers the small enterprise, SOHO, remote offices and multi-location enterprises a cost-effective, easy to deploy VoIP FXO solution. The GXW410x series allows any business to seamlessly connect multiple locations with up to 8 PSTN lines, to an IP PBX system, or with an existing traditional phone system. 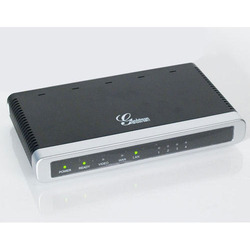 The Grandstream GXW4232 is a 32 FXS port VoIP gateway that can be used to connect analog devices such as phones and faxes to a VoIP network. 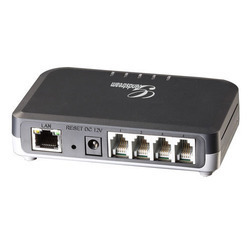 Support for several voice/fax codes and a combination of 32 RJ11 FXS ports and a 50-pin Telco connector makes the GXW4232 versatile for a variety of uses. The Grandstream GXW4232 is a next generation high performance high-density VoIP gateway that is fully compliant with SIP standards and broadly interoperable with various VoIP systems, analog PBX and phones on the market. The GXW4232 features 32 FXS analog telephone ports, superb voice quality, rich telephony functionalities, easy provisioning , flexible dialing plans, advanced security protection, and excellent performance in handling high volume voice calls. The Grandstream GXW4232 VoIP gateway offers small-to-medium businesses a cost-effective hybrid IP and analog telephone system that allows them to enjoy the benefits of VoIP communications while preserving investment on existing analog phones, fax machines and legacy PBX systems. The Audio Codes MP118-8FXS Gateways are well-suited for commercial VoIP deployment. The Media Packs are third generation products that have been designed to meet real market needs. The Media Packs are vastly deployed in the MTU (Multi Tenant Units) broadband access networks, IP Centrex and rural areas. 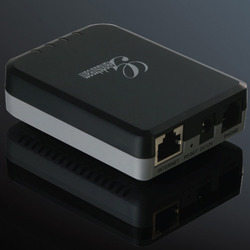 The Audio codes Media pack Gateways are well-suited for commercial VoIP deployment. Field-proven voice and fax technology and feature-rich design makes the Media Packs an excellent solution for various emerging VoIP applications. 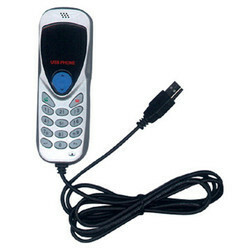 The Media Packs are used in VoIP-based PBX or IP-PBX architecture as a mediation gateway and remote analog extension. It is also used for optimizing voice transmission over satellite links, payphone networks, centralized IVR and Quality Monitoring applications. The Media Packs by Audio Codes are vastly deployed in the MTU (Multi Tenant Units) broadband access networks, IP Centrex and rural areas. SETU ATA1S and ATA2S are analog telephony adaptors with FXS ports to connect analog telephone instruments, multiple SIP Accounts to register with VoIP carriers (ITSPs) and Ethernet ports to connect IP network. 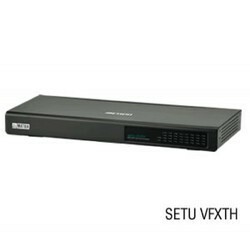 MATRIX VOIP GATEWAY WITH 8 VOIP, 8 FXS AND 1 FXO PORTS [SETU VFX808]Matrix Fixed VoIP to FXO-FXS Gateways SETU VFX808 SETU VFX is a range of multi-channel SIP gateway offering seamless connectivity between VoIP and PSTN networks. These gateways offer 4 to 32 FXO/FXS ports to connect TDM based telephony infrastructure to an IP network. For organizations those already migrated to IP, SETU VFX provides POTS trunking option. SETU VFX series offers up to 32 VoIP channels, Fax over IP support and flexible dialing plans. The dedicated signal processing resources and superior protocol set ensures multiple call capabilities with toll-grade voice quality. SETU VFX enables small and medium businesses to create seamless office environment, integrate a traditional phone system into IP network and significantly reduce communication costs.These gateways are ideally suited for business and consumer VoIP services including call centers and multi-location environments. MATRIX [SETU VFXTH0024] FIXES VOIP TO FXS-FXS GATEWAYS SETU VFX is a range of multi-channel SIP gateway offering seamless connectivity between VoIP and PSTN networks. These gateways offer 4 to 32 FXO/FXS ports to connect TDM based telephony infrastructure to an IP network. For organizations those already migrated to IP, SETU VFX provides POTS trunking option. MATRIX 8 PORT FXO - 8 PORT FXS VOIP GATEWAY WITH 16 VOIP CHANNEL - [SETU VFXTH0808]Fixed VoIP to FXO-FXS Gateways SETU VFX is a range of multi-channel SIP gateway offering seamless connectivity between VoIP and PSTN networks. These gateways offer 4 to 32 FXO/FXS ports to connect TDM based telephony infrastructure to an IP network. For organizations those already migrated to IP, SETU VFX provides POTS trunking option. 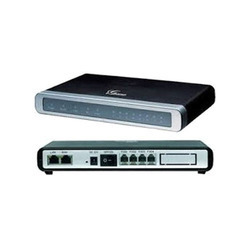 MATRIX 16 PORT FXO - 16 PORT FXS VOIP GATEWAY WITH 32 VOIP CHANNEL - [SETU VFXTH1616]Fixed VoIP to FXO-FXS Gateways SETU VFX is a range of multi-channel SIP gateway offering seamless connectivity between VoIP and PSTN networks. These gateways offer 4 to 32 FXO/FXS ports to connect TDM based telephony infrastructure to an IP network. For organizations those already migrated to IP, SETU VFX provides POTS trunking option. 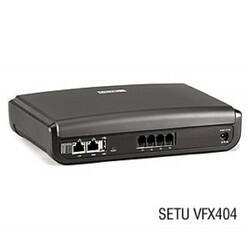 MATRIX 32 PORT VOIP FXS GATEWAY WITH 32 VOIP CHANNEL - SETU VFXTH0032Fixed VoIP to FXO-FXS Gateways SETU VFX is a range of multi-channel SIP gateway offering seamless connectivity between VoIP and PSTN networks. These gateways offer 4 to 32 FXO/FXS ports to connect TDM based telephony infrastructure to an IP network. For organizations those already migrated to IP, SETU VFX provides POTS trunking option.